Dealbh Joyce i gcathair Bhaile Átha Cliath. 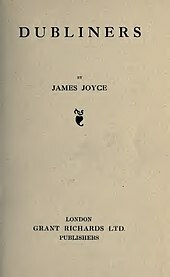 Scríbhneoir a rugadh i mBaile Átha Cliath in Éirinn ab ea James Augustine Aloysius Joyce (gaelaítear a ainm mar Séamus Seoige scaití). (2 Feabhra 1882 – 13 Eanáir 1941). Ba i mBéarla a scríobh sé a chuid saothair, ach feictear ina mhórshaothair ar nós Ulysses (1922) agus Finnegans Wake (1939) go raibh an-eolas aige ar nua-theangacha na hEorpa, beagán Gaeilge san áireamh, chomh maith le Laidin, Gréigis, Fraincis, Spáinnis, Iodáilis agus mórán eile nach iad. Tá easaontas i measc lucht litríochta ar fheabhas chuid den scríbhneoireacht sna leabhair sin, mar go bhfuil an teanga casta, le meascán teangacha, agus mar gur i bhfoirm sruth smaointe atá cuid mhór de. Is cur síos ar lá amháin i saol fhir óig an chuid is mó de Ulysses, agus ceiliúrann lucht liteartha Bhaile Átha Cliath agus a gcairde Lá Bloom (Bloomsday) ar 16 Meitheamh in ómós do laoch an leabhair, Leopold Bloom. Chaith sé cuid mhór dá shaol san Eoraip, i bPáras na Fraince, i Zürich na hEilvéise, agus i dTrieste na hIodáile sa chuid ba mhó. Fuair sé post i mbanc sa Róimh fosta ach b'fhuath leis an chathair úd agus d'fhill seisean agus a theaghlach go Trieste i ndiaidh tamaill ghairid. B'as Gaillimh a bhean, Nora Barnacle. Bhí iníon agus mac acu. Ghoill an glácóma air, agus é ag druidim le deireadh a shaoil ach go háirithe, agus bhí an-deacracht aige léamh profaí a dhéanamh ar a chuid leabhar. Fuair sé bás i Zürich nuair a tháinig cóma air i ndiaidh obráid ar othras bréifneach. Is cinnte go raibh an-tionchar ag an stíl sin ar údair eile, agus go bhfuil an-éacht déanta aige i gcuid dá chuid cur síos. Eolas faoin saol a chaith James Joyce, tuairiscí ó lucht a chomhaimsire srl. Tugadh an leathanach seo cothrom le dáta an 18 Nollaig 2018 ag 18:01.